I was having withdrawals from the amazing tostadas at the Taco Bus in Tampa, and I had to find a way to lighten it up and still get the same effect. Since the best thing about a tostada is the crunchy fried shell, I knew my version wouldn’t be exactly the same, but whatevs! 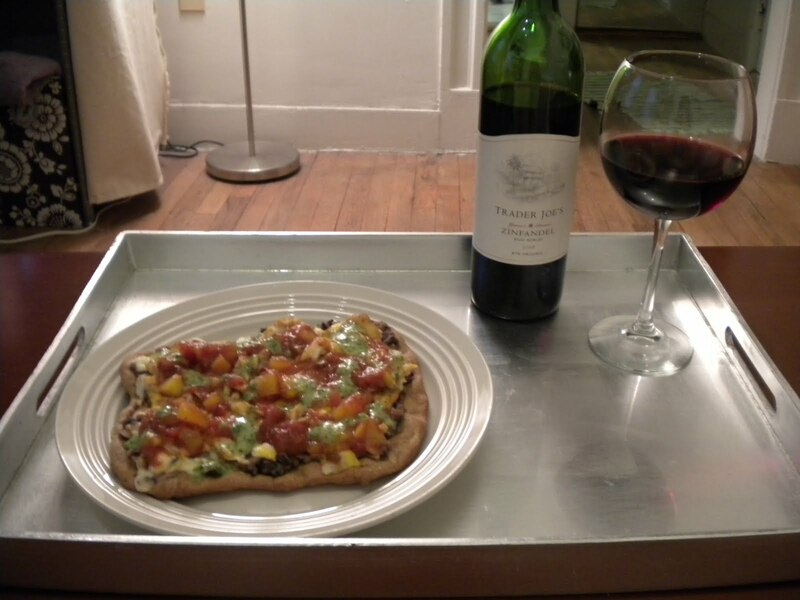 I took whole wheat pizza dough from Trader Joe’s and stretched it out as thin as possible and put it in to bake at 400. One of my pizza dough tricks is Reynolds Wrap Non Stick Foil. This stuff is amazing! Nothing sticks to it, and no oil needed. I baked the shell and put it to the side. Onto the fish. Tilapia was on sale at Whole Foods, so I thought I’d give it a whirl. I rubbed it with a little olive oil, and adobo powder, and baked it until it was flaky. Next I took a can of black beans, mashed them with a fork, and added some salt, pepper, cumin, and garlic powder. I smeared some mashed black beans on the shell, sprinkled with Colby jack and flaked tilapia, and popped it in the oven. Now I start getting a little whacky! Since my curried tuna salad, I have been obsessed with herbed vinagrettes (more to come). I had just made another bunch of cilantro dressing so I thought that would make a perfect condiment. I also took some frozen and thawed mango, and diced it up. Threw it in some jarred salsa and voila… mango salsa. So after a few minutes the faux-stada shell with beans, cheese, and tilapia was out of the oven. I drizzled a little cilantro vinaigrette, and dolloped mango salsa and dinner was served! It turned out pretty well. Not quite Taco Bus quality, but it hit the spot for a fraction of the calories. Follow Up: I baked all of the dough last night so I had left over shells. I made this again tonight the same way but added avocado. There isn’t much that isn’t improved by avocado. Yummmmmm! !